At Andent we embrace the future. We are digital ready. 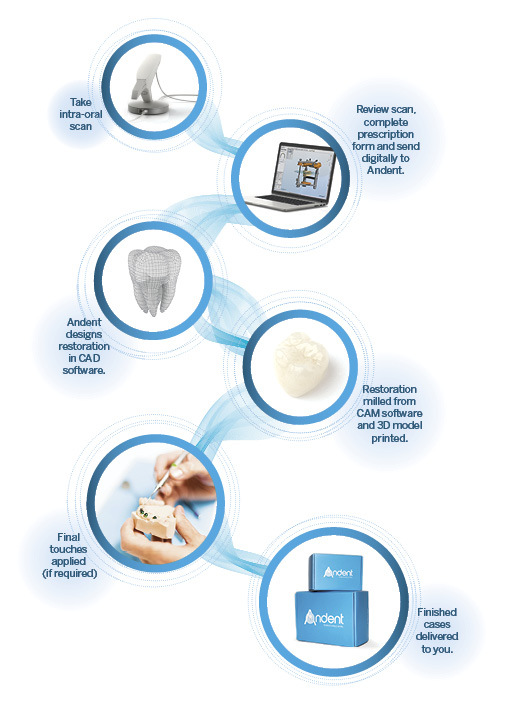 Digital Workflow solutions can provide your practice with consistent, superior results through optimised workflow. At Andent our full digital workflow solution means faster turnaround and more precise results with minimised chair time, greater accuracy, guaranteed increased patient satisfaction. Quality assurance using precise 3D resin printed models. 8. You can now refresh your Trios scanners Lab connections to include Andent. A connection between your iTero intraoral scanner account and Andent must be established before you can send the scans to us. 3. Identify ANDENT as your preferred laboratory and forward the Digital impression, within minutes we can confirm the case is accepted. 1. In CS Imaging, select the file & click the CS Connect button. 1. Sign in to dropbox.com, and click on Share a folder... at the top of the window. 3. Click Next, and enter [email protected] to invite Andent to share the folder. 4. Add a personal message if you’d like, and click Share folder.